Alzheimer’s disease (AD), the sixth leading cause of death in the United States, has become our country’s national healthcare nightmare—one from which we won’t wake up anytime soon. An estimated 5.4 million Americans currently suffer from AD. As baby boomers advance in age, the numbers create a frightening scenario. According to the Alzheimer’s Association, an American develops AD every 68 seconds, a figure expected to increase to every 33 seconds by midcentury. Projections suggest that as many as 16 million will have AD by 2050. Among Americans aged 65 and older, one in eight has AD while nearly one-half of people aged 85 and older suffer from it. The annual cost of caring for individuals with AD, or the economic value of unpaid care for AD patients, has reached $200 billion, according to Matthew Baumgart, senior director of public policy for the Alzheimer’s Association. That figure can be broken down into four segments. Government programs, in the form of Medicare and Medicaid, spend $104.5 billion and $35.5 billion, respectively. Another $33.8 billion is attributed to out-of-pocket expenses. And another $26.2 billion originates from private health insurance, HMOs, and other uncompensated care. The economic value of unpaid care for AD patients, which is often provided by family members, friends, and neighbors, is estimated at $210 billion, while the cost of healthcare provided by paid caregivers is $8.7 billion. The economic impact of AD patients on Medicare and Medicaid, compared with other older adults without AD, presents a startling eye-opener. Baumgart notes that in 2008, the average annual per-person Medicare payment was $7,621 while the average annual per-person payment for patients with AD was $19,820 (in 2011 dollars). For example, Baumgart says a patient with diabetes and AD costs 81% more to treat than a patient with only diabetes. Similarly, for a patient with AD and heart disease, the treatment costs are 61% higher than those related to treating only heart disease. For cancer patients with AD, costs are 53% more than those to treat only cancer. “Dementia makes it more difficult to treat those other conditions,” he explains. Research shows the annual rate of hospital stays among older adults to be 234 per 1,000 elders as opposed to 780 older adults with AD and other dementias per 1,000 elders. For Medicaid recipients, in 2008 the average annual per-person Medicaid payment for older adults without AD or other dementias was $527 vs. $10,120 for elders with AD or other form of dementia (in 2011 dollars). On average, AD patients live from four to eight years following their diagnosis. “Some can live as long as 10, 15, or 20 years,” Baumgart says. The trajectory of the progressively worsening disease can result in the inability to complete activities of daily living, bladder and bowel incontinence, wandering or becoming lost, or undergoing significant personality or behavioral changes. Statistics show that about 4% of Americans without AD enter nursing home facilities by the age of 80. By contrast, 75% of AD patients will enter nursing home facilities by the same age, according to Baumgart. He says Medicare data from 2008 show that 64.5% of nursing home residents had AD, indicating an increase from 2004 figures that showed 53% of nursing home residents suffered from AD. Many older adults mistakenly believe that Medicare will cover the costs of nursing home care for elders with AD. Family members frequently are surprised to discover that this is not the case. Prospects are frightening for the numbers of individuals who will develop AD over the next few decades and the costs associated with their care and treatment. Currently, 10,000 baby boomers reach the age of 65 every day, according to Baumgart. And that pace will continue to occur for another 17 years. “Sixty-five is the age at which the risk for AD increases,” he says. With no treatments to arrest or cure AD, research offers the best hope for future efforts designed to limit or eliminate the disease. The amount of money that will be required to cover the costs of caregiving for AD patients over the next four decades is simply overwhelming. “The problem is, not enough is being done,” Baumgart says. “The policy imperative here is to prevent having to spend this.” He cites statistics indicating that the National Institutes of Health (NIH), which funds medical research, this year will spend $498 million on AD research. Contrast that figure with the $140 billion in Medicare and Medicaid funds the government will spend caring for people with AD. “For every $100 the NIH spends on research, the government spends $28,000 on care,” Baumgart says. The answer, he notes, lies in additional funding for AD research. To that end, Baumgart proposes the 1% solution. He says boosting NIH research funding by 1% of the 2012 AD care costs of $200 billion could significantly impact the financial crisis AD presents. A treatment that hypothetically would become available in 2015 that could delay the onset of AD by a mere five years, similar to Lipitor’s ability to delay the onset of heart disease, could result in an estimated $42 billion spending reduction for AD in 2020. 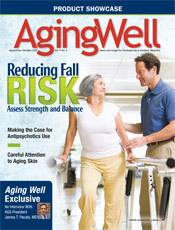 — Barbara Worthington is the editor of Aging Well.